Q: Was Ronald Reagan originally cast as Rick? Q: Is the character Victor Laszlo's name mispronounced? It's one of the great Hollywood legends how George Raft helped make Humphrey Bogart a leading man by turning down in succession, High Sierra, The Maltese Falcon, and Casablanca. Maybe Raft showed some good sense in letting a better actor handle those roles. In any event we've got some proof in the case of Casablanca. Check out some time a film called Background to Danger that Warner Brothers did with George Raft that also featured Peter Lorre and Sydney Greenstreet. Had Raft ever done Casablanca the film would have been a routine action/adventure story just like Background to Danger. Instead with Bogey we get that, but also one of the great love stories of the century. 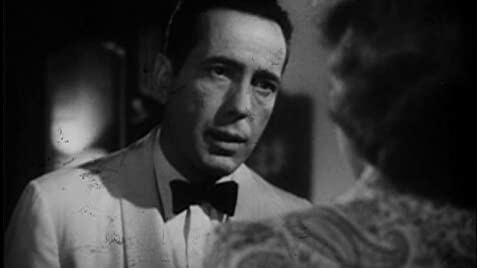 Humphrey Bogart set the standard for playing expatriate American soldiers of fortune in Casablanca. Right now he's between wars running Rick's Cafe Americain in Casablanca in Morocco, an area controlled for the moment by the Vicky French government. He's got his fingers in a whole lot of pies, but Bogey operates with his own code of ethics. He sticks his neck out for nobody. Nobody except the great love of his life Ingrid Bergman who left him mysteriously in Paris as he was fleeing the oncoming German occupation. She walks back into his life with a husband, Paul Henreid who is a well known anti-fascist leader. The rest of the film is a contest for Bogey's soul. Torn between his great love, his own anti-fascist beliefs, and certain practical necessities of operating a liquor and gaming establishment in a hostile environment. So many things combine to make Casablanca the great film it is. Ingrid Bergman's lovely incandescence melding and melting Bogey's cynical screen persona. The indelible characterizations of Peter Lorre, Sydney Greenstreet, Claude Rains, Conrad Veidt and the whole rest of a 100% perfectly cast film. And the revival of a great ballad which serves as Casablanca's theme song. I say revival because As Time Goes By was introduced in 1931 in the George White Scandals on Broadway by Rudy Vallee. He made a record of it which sold quite a few disks back then. 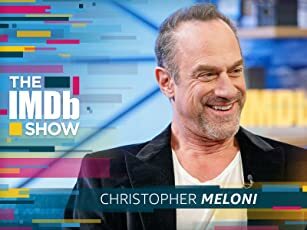 But by the merest of coincidences there was a strike that lasted two years that just began around the time Casablanca came out. The Musicians Union struck against the record companies. With no new records being made RCA Victor re-released Vallee's record and it became a monster hit on revival. 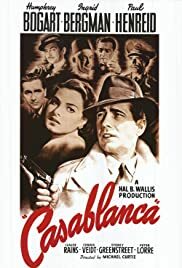 Also when Casablanca came out as if the White House had a personal interest in the film FDR and Churchill had the first of their wartime conferences in----Casablanca of all places. Jack Warner must have said a prayer for that to happen. There are so many classic scenes and lines from Casablanca you can write a comment just by listing them. But my favorite has always been when the Germans have taken over Rick's place and are singing some of their songs, Paul Henreid goes to orchestra leader and asks him to lead La Marsellaise. With a nod from Bogey, the orchestra plays, Henreid leads them and the rest of the non-Germans in the cafe join in. Over 60 years later, one still gets a thrill from that act of defiance. Bogart and Rains were nominated for Best Actor and Best Supporting Actor. Any of the others could have been as well. As I said before Casablanca is perfectly cast right down to minor roles like Curt Bois as a pickpocket, John Qualen as a fellow resistance leader, and S.Z. Sakall as a waiter at Rick's. If there was an award for ensemble cast, Casablanca would have won it. As it was it did win for Best Picture of 1943 and best director for Michael Curtiz. Casablanca will be seen and loved by filmgoers for generations unto infinity, as time goes by. 121 of 148 people found this review helpful. Was this review helpful to you?